The first thing I learned to cook reliably and repeatedly was an omelet. I was pretty confident in my abilities to make a really good one, but in hindsight I usually overcooked them. I was always so worried about undercooked eggs that I would char the crap out of them. To counteract the rubbery egg effect, I would just pile on cheese. Omelet done. 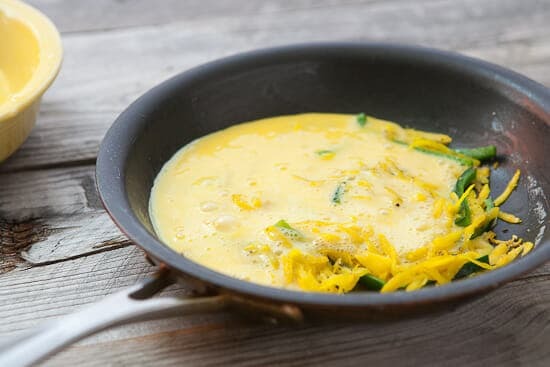 I ate these omelets for years (and served them to many) before learning things like: 1) My stove has a temperature setting other than HIGH and 2) Eggs cook quickly and will continue to cook after you remove them from the heat. So my omelet game has changed a lot over the years. I’m try to be more gentle on the heat seettings. 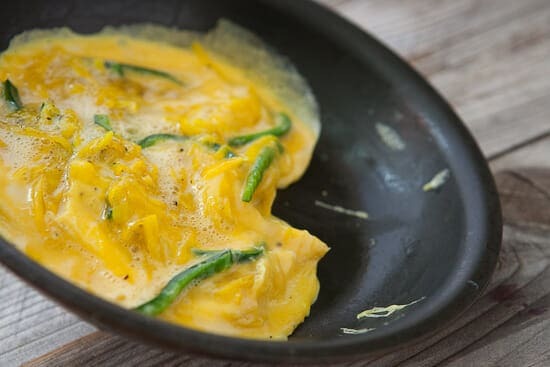 Also, sometimes I’ll fold ingredients into an omelet like in my asparagus and ham omelet, but I used a slight different (and easier) method for this omelet. The golden beets cook right into the eggs and you end up with almost a thin frittata. It’s an easy breakfast, for sure, and I just love the golden color and slight sweetness that the beets give. 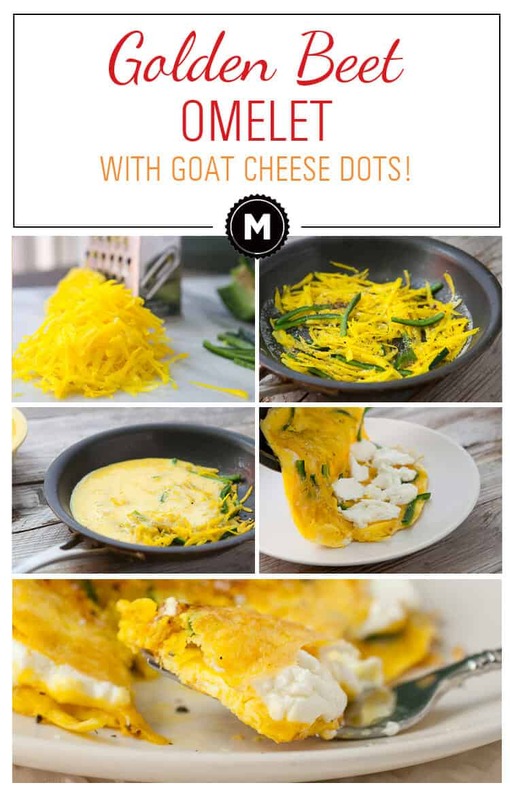 Beet omelet with shredded golden beets, slivered poblano peppers, and big dots of creamy goat cheese. My new favorite fast breakfast. 1) Cut poblano in half and remove seeds. Slice into slivers. 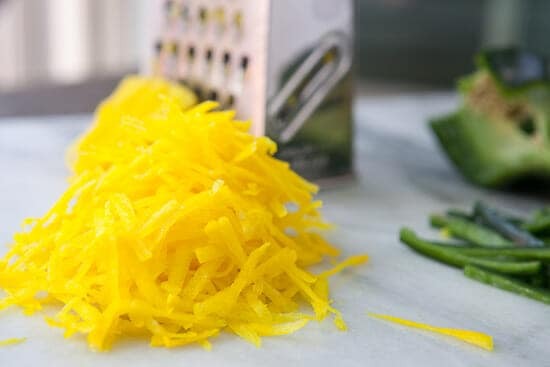 Peel golden beet and grate it using a box grater. 2) Whisk 2 eggs until fluffy. 3) In a small nonstick omelet pan, add 1 teaspoon of butter over medium heat. Once melted, add shredded beets and poblano and cook for 3-4 minutes until they start to soften. Season with salt and pepper. Remove half of the mixture for the second omelet. 4) Spread beet mixture out over the surface of the pan and pour in eggs. Swirl eggs around to cover the whole pan. As eggs cook, use a flexible spatula to push eggs gently to the center and allow uncooked egg to flow to the outer edges of the pan. 5) Cook omelet until eggs are mostly cooked. Optionally, you can cover the pan for 30-45 seconds to really set up the eggs on top. A thin film of uncooked eggs on the surface is okay though in my book. You don’t need to flip the omelet at all. 6) When the egg is set to your liking, dot half of the pan with goat cheese. Use a heavy hand with it. 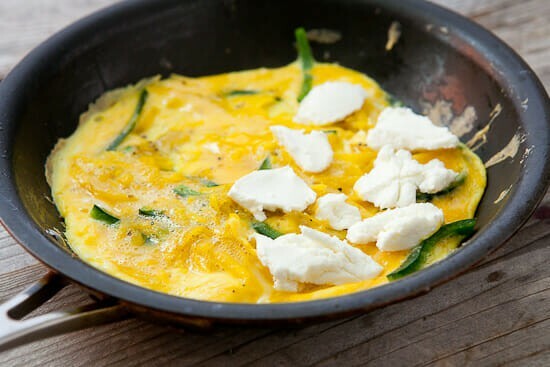 7) Once the goat cheese is on the eggs, carefully slide the omelet out of the pan and fold it over itself on your plate. The warmth from the eggs will gently melt the goat cheese. Serve sprinkled with salt and pepper and a dash of hot sauce if you want. Repeat for second omelet. Golden beets just make sense for this omelet. They don’t stain the eggs or anything and have a nice bright color and sweetness. 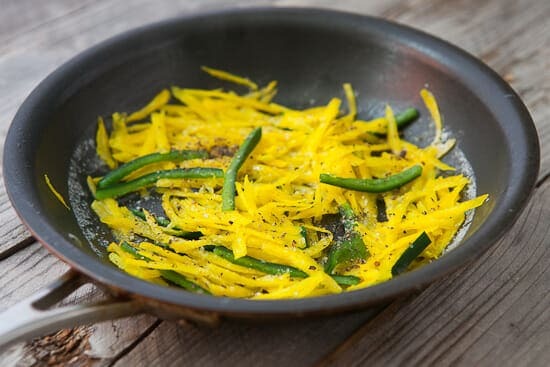 One golden beet will easily make two omelets. Peel the beet and shred it with a box grater. While you are at it, go ahead and slice up a poblano also. Try to cut it into thin strips. Omelets are basic and I wouldn’t trust an omelet recipe with more than a few ingredients. Eggs, butter, and cheese are all on my list of essentials though. For this omelet, I recommend cooking the veggies into the eggs a bit, rather than folding them in. Add about a teaspoon of butter to a small omelet pan and add the shredded beets and poblanos. Season these with salt and pepper and cook them over medium heat until they soften (3-4 minutes). 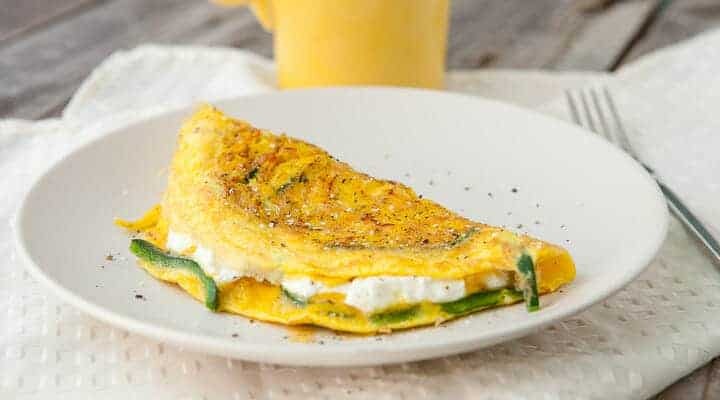 If you are planning on making two omelets, remove half of the mixture once it is cooked and set it aside for the second omelet. Then pour in your whisked eggs. I’ve gone back and forth on whether I like to add cream or water to the eggs, but these days I just whip them really well and call it good. Once the eggs are in the pan, keep your heat on medium or medium-low. The eggs will cook quickly and the biggest mistake I think people make with omelets is overcooking the eggs. As the eggs set, use a spatula to gently push the cooked egg to the center and let the uncooked egg drain to the outer parts of the pan. Things you don’t need to do to make this omelet: FLIP IT. Not necessary. 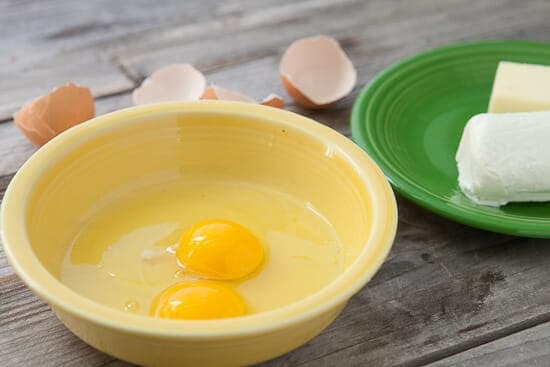 The eggs will cook just fine on their own if you keep scraping the uncooked egg from the top to the sides. If you are really worried about a little uncooked egg, what I would recommend is covering the skillet for 30 seconds with a plate or lid. That will steam the omelet and really set the top layer of egg. The very last thing you want to do is add the goat cheese. Goat cheese is already a soft cheese and so you don’t want to melt it completely or it will just pool and be gross. Warming it though is fine. You should plan to get the omelet out of the pan right after you add the cheese. This is how I remove my omelet. 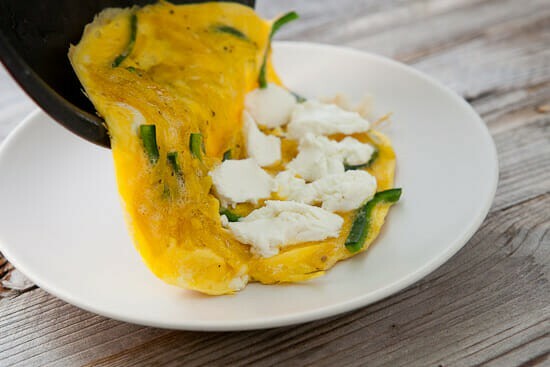 Assuming you have a decent omelet pan that’s nonstick, carefully giggle the omelet and start sliding it out toward the cheese side. 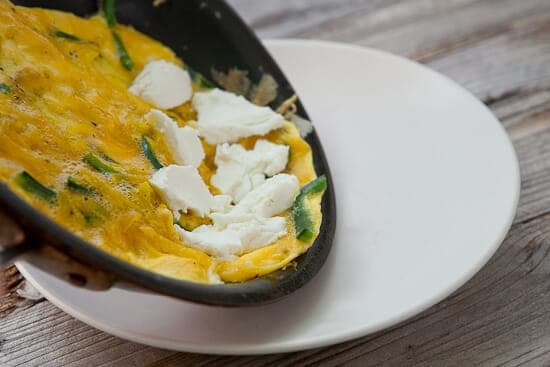 Let the omelet slide out of your pan and onto the plate. As the omelet slides out, flip the top part over the cheesed half! And like that, your omelet is done! The residual heat from the eggs will warm the goat cheese. I just love how the shreds of golden beet get cooked into the eggs. It’s an awesome texture and really works. In my opinion, this omelet just needs a little salt and pepper although hot sauce is an option as well! This looks awesome! 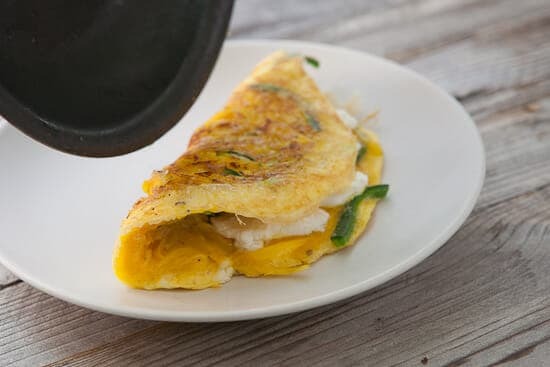 Do you have an especially good way to keep omelette #1 warm while you cook #2 or is it just one of those things that should be eaten immediately no matter what? Hey Mark! Honestly they cook so quickly, if I’m making two, I’ll just make one, put it on a plate and cover it with a lid or foil and then quickly make the second one. The first one will stay warm for 5 minutes no problem. Longer than that though and you might have to figure out a warm oven situation… Good luck! I can cook like crazy; pretty much anything you can think of – but I’m terrible at cooking omelets. It’s like some kind of dark mystery for me. Thanks for posting this recipe. It seems that it’s a bit easier to cook the stuffings a bit first rather than fold them in. The notes about pushing the cooked egg inward and the uncooked egg outward are a big bonus too. Hey Dave! Yea… I know what you mean. It’s definitely one of those things that is trickier than it looks. The big trick for me that helped me was just turning down my heat. Eggs don’t need a lot of heat to cook and cranking the heat up to high leads to issues. Give it a shot though. Good luck! « It Takes a Village Recipes Home » Black Bean & Corn Tortilla Tart Situation + A Giveaway!